Sometimes at a concert, if you’re lucky, the room will fade away and the music will ring out twice as loud. Your spirit attaches to the notes as your soul hovers, if only for a moment, one with the sound. These are the moments music fans live for. They can occur in arenas and outdoor sheds, but they’re most likely to appear in small, sweaty spaces where strangers are forced to jostle and celebrate in uncomfortably close proximity. 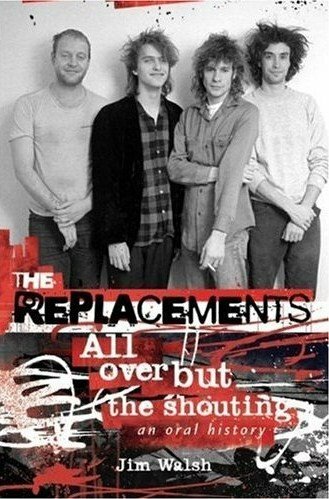 “All Over But the Shouting,” an oral history of the Replacements by Jim Walsh, is a book of such moments. By forgoing the traditional narrative voice, Walsh lets the fans tell the story of their favorite band. Through their accounts, you can feel the group’s egotistical hesitancy at early gigs at the Longhorn bar and 7th Street Entry in Minneapolis. The quartet didn’t quite have the magic yet, but they could feel the potential, and hoped the elements would coalesce in time to produce. The first-person accounts take readers behind the scenes, to conversations with junior high and high school classmates, and men and women who caught each other’s eyes for the first time, like ‘Mats lead singer Paul Westerberg and his future wife, Laurie Lindeen. The text crackles with the energy of early enthusiasts like Emily Boigenzahn. She appears early in the book as a major ‘Mat’s fan, only to have the band pull the rug out from under her when they hire her father, Slim Dunlap, to replace founding guitarist Bob Stinson. After hearing her champion the band so frequently, her heartache is especially resonant at learning her dad is now in her favorite band. Walsh admits his fanboy bias in the preface, but let’s detractors and critics weigh in. Fans, especially long-time devotees, are never shy about pinpointing the precise moment the band lost the plot in their eyes. Walsh is especially deft handling the firing of Stinson and original manager Pete Jesperson, weaving historic quotes and news stories with contemporary interviews. Walsh is also frank in his treatment of the ‘Mats final days, when Westerberg and bass player Tommy Stinson were the only founding members left in the lineup. Walsh lets lame-duck drummer Steve Foley gush about the gig, but doesn’t sugarcoat the end of the reign. The only time Walsh’s approach lets him down is on the creative side. We hear plenty of stories about where people were the day an album came out or when a song was released to radio, but very little on Westerberg’s songwriting process. This deficiency is especially glaring in the pages dealing with the band’s transition from their second album, “Hootenany,” to the more realized “Let It Be.” Westerberg’s writing matured significantly during that time, but we have no glimpses into what may have occurred to spur this growth. The book runs past the end of the band, letting fans weigh in on Tommy Stinson’s current gig with Guns ‘N’ Roses, and giving Westerberg (through secondary sources) and Dunlap speculate on the chances of a ‘Mats reunion (not good). Walsh is at his finest during the 50 poignant pages covering Bob Stinson’s final days. Friends, random people Stinson befriended at bars, his last girlfriend, and even Stinson’s mom paint an unvarnished picture of Stinson’s post-Replacements life, his generous spirit and addictions. Walsh’s longtime relationship with the band shines as he places these remembrances in context alongside news stories he wrote at the time, other local coverage and the eulogy Walsh delivered at Stinson’s funeral. As with most stories, a hint of melancholy runs throughout the book, but it is never overshadowed by the glorious free spirit of the music. “All Over But the Shouting” assumes the reader already has a working level of knowledge about the band, and therefore may not be the best read for newcomers. Beginner’s just discovering the band through the song “Alex Chilton” after its namesake’s passing are advised to put in some time with the ‘Mats catalog before wading in. For longtime fans, “All Over But the Shouting” is nearly as enjoyable as hearing those classic ‘Mats recordings again for the first time.